Signature specialty loaves from Zingerman’s Bakehouse. The Deli Deluxe Bread Box features classic foundation breads from our Bakehouse. This one gives center stage to more flamboyant, creative endeavors. 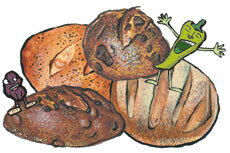 Some traditionalists may stick up their noses at the idea of cheese, pepper or chocolate in bread. But judging by the popularity, they’re in the minority. Gift boxed collection of Chocolate Sourdough, Cinnamon Raisin, Parmesan Pepper, and Peppered Bacon Farm breads. Freezer bags included for long-term storage.